Facebook is looking to get in on app linking standards with a new program it unveiled at F8 today. AppLinks is a multi-platform mobile deep linking standard that allows for direct linking from app to app, and has already caught the eye of a number of high profile developers. The AppLinks program would essentially allow for developers to directly link users to specific content within their apps and to others, avoiding the mobile browser completely. Apple, Google and even Microsoft have all been developing similar deep linking initiatives, but due to the cross-platform nature of the company, Facebook feels it is in a unique position to helm an open source mobile app linking program. Right now it is very cumbersome for developers to implement mobile, cross platform links, but with AppLinks they can drop "a few tags" into their site's html to link users directly to a certain part of an app, for example. There are a number of major developers and services that are adopting the system including Hulu, Quip, Dropbox, Spotify, Pinterest, and Flixster among others. 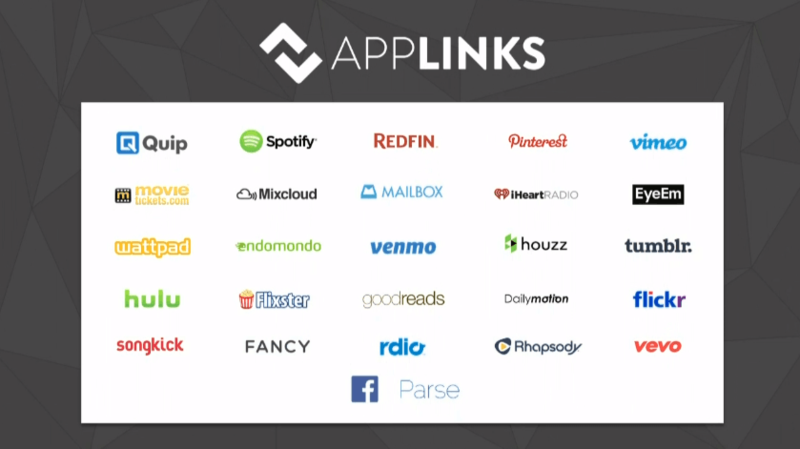 Facebook's apps are said to already support AppLinks as well. As Apple has made it slightly easier to implement links of this nature on its platform over the years, Google launched a mobile app indexing initiative of its own last year. It indexes apps similar to its web crawlers and then links users directly to that content inside of an app. At the time, Google had signed on supporters like Wikipedia, IMDb and Open Table.